Higher education attainment in South Dakota has increased at a slow but steady pace since 2011. At that time, 39.4 percent of residents in the state held a college degree or credential; by 2014, that number had risen to 45.1 percent. A great deal of work is still needed in order to meet the growing demand of industries in the state. However, the numerous South Dakota colleges are poised to meet that demand through a variety of programs. 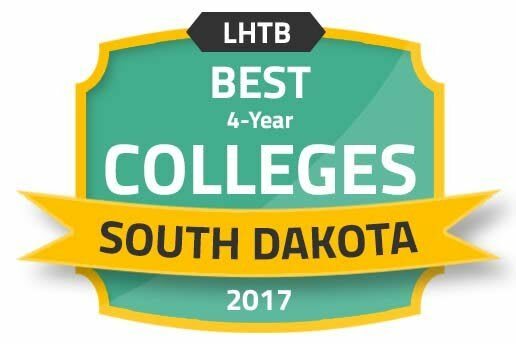 Students interested in attending college in South Dakota can get a good overview of the higher education landscape through this guide. We looked at tuition rates, financial aid packages, alumni compensation, cost of living in metropolitan areas and college planning tools offered by the state. With all the important factors that contribute to selecting a school, researching colleges can quickly become overwhelming. To aid in the college search, we have compiled the list below that ranks South Dakota colleges and universities based on factors like tuition cost and graduation rates. Check out the top-ranking schools in South Dakota for the 2017-2018 school year below. Want to dive a bit deeper than the rankings list? This search tool lets students to do just that by allowing them sort schools by various factors like student population, location and acceptance rates. The results can then be compared side by side to provide an even more comprehensive look at the potential colleges in South Dakota. From the early college preparatory stages to the stresses of planning life after graduation, college can be challenging, and students are often looking for all the help they can get. South Dakota provides several resources to help empower its future and currents students, from assisting with high school schedules to helping graduates find new jobs. Below are a few of those student resources. Students who choose to get a jump-start on college courses can be rewarded with lower tuition rates. As of the 2016 school year, rates for early starters were just over $48 per credit hour. Courses are available online, in person at one of six on-campus locations or at one of three University Center locations. Eligibility requirements vary depending upon whether a student is a junior or senior and include a certain ACT or SAT score, meeting a minimum GPA and taking certain required courses. Those who want to attend college in South Dakota might be eligible for reduced tuition programs at the school of their choice. These programs are dependent upon certain criteria and are available for certain populations, such as those over the age of 65, military veterans, children and spouses of deceased or disabled public servants, state employees, K-12 teachers, and those who have residency in partner states like North Dakota, Wyoming and Minnesota. These programs are designed to help students who come from disadvantaged backgrounds, including those from low-income families, those who are the first in their families to go to college and those who are disabled. Programs available in South Dakota include Upward Bound, Educational Talent Search and student support services specific to certain institutions in South Dakota, as well as national programs open to South Dakota students. Understanding tuition and financial aid is one of the most important steps a student can take toward understanding the cost of college. These charts feature average tuition rates in the state, the average financial aid award and how many students actually receive those awards. By combining all of this information, prospective students can gain a better understanding of what they can expect to pay to attend college in South Dakota. Solely looking at tuition will not accurately display the costs of attending a college. Instead, students should look at the net price, which is the cost of attendance minus any financial aid awarded. The following six South Dakota schools are the most affordable in terms of the lowest net price. How much will students make upon graduation? Though that answer depends on numerous factors, including the field of work the student chooses, there are some colleges that tend to produce alumni with higher salaries. These six colleges in South Dakota have the highest paid alumni ten years after their graduation. High student loan payments can quickly negate the thrill of a great paycheck. These colleges in South Dakota produce alumni with the lowest amounts of student debt in the state. In addition, we have compared them to the national average, so students considering a student loan can see exactly where they stand. When considering the cost of school, students often overlook the cost of living, which can affect a student's budget greatly. South Dakota boasts a cost of living that is lower than the national average, and the costs of housing and transportation are particularly attractive when compared to that of other states. We have examined the cost of living in metropolitan areas of South Dakota, as well as the entire state, to help students gauge expenses for attending a college in South Dakota. Prospective students should consider a school's accreditation status. Accreditation is vitally important, as it means an independent accrediting body has evaluated the school and found it to fulfill the requirements of a quality education. A degree earned from an accredited school typically holds a great deal of weight and allows students more opportunities for financial aid and for easier credit transfers. The National Association of Schools of Music, Commission on Accreditation accredits all music programs, both degree granting and non-degree granting, at Augustana University. The National Council for Accreditation of Teacher Education accredits bachelor's and graduate programs in teacher education at Black Hills State University. With a population of over 22,000, Brookings is the fourth most populous city in South Dakota, and the second largest manufacturing community in the state. From its historic buildings to its shops to its tasty restaurants, Brookings has a little something for everyone. Nine colleges make up this large university in the heart of Brookings. As the state's largest and most comprehensive higher education institution, SDSU serves over 12,500 students. Those students can choose from 73 majors, 36 specializations, 33 master's programs and 15 PhD programs, as well as two professional doctorates. Online and off-campus courses provide students with a more flexible way to obtain their education. Known as the "Heart of America," Sioux Falls is nestled on the banks of the Big Sioux River on the borders of Minnesota and Iowa. The city itself has a population of over 173,000, and the greater metropolitan area is home to over 250,000 people. Major employers include those in healthcare, grocery, banking and food products. Founded by the Lutheran Church in 1860, Augustana welcomes students of all faiths and religions. Today, the college serves over 1,800 students in 53 majors, 41 minors and 15 pre-professional programs for undergraduates, as well as graduate and continuing education programs. Most students live on the 100-acre campus. Students seeking an associate degree, diploma or certificate can take advantage of one of the more than 50 programs at Southeast Technical Institute. Programs are focused with the intention of all students graduating within 24 months of enrollment. In fact, Southeast Tech turns out the third largest graduating class in the state, not to mention it is one of the most affordable post-secondary institutions in the state. This Christian, liberal arts school affiliated with the Southern Baptist church has a 98 percent placement rate for graduates. A 14-to-1 student-to-faculty ratio fosters intimate classroom settings for students in over 80 programs. Of the almost 1,500 students, 100 percent of them received financial aid as an incoming freshman. With well over 100 clubs and within an easy day's drive to several Midwestern cities, USF offers plenty of opportunities for fun. This investment plan for parents, students and other interested parties provides college savings and tax benefits for those who start savings for college early. Designed for professional counselors, this site offers information for parents and students on college fairs throughout North and South Dakota. This area of the state website is a gateway to various employment opportunities, including SD Works, the state's biggest job site. This service of the Board of Regents provides information to those in high school and middle school, career seekers, adult learners, transfer students, parents and college counselors. This professional association of TRIO professionals in the state provides information for students and parents on initiatives available to aspiring students in South Dakota. This organization focuses on promoting education in the state and provides resources focused on financial aid and special programs for college students.